We’ve met a couple of times, and you were great for the most part, but I still feel like I didn’t really know you. After some time apart, I can say that you’ve redeemed yourself with this past weekend, ultimately deserving a much, much longer post than usual. This time around, Montreal, you’ve really outdone yourself. Jess and I took this weekend trip up north to escape the stress of work and being an overall new adult. It has been over a year since my last visit to the city, so it was time to see how much had changed and the the things I had missed. So settle down with a cup of coffee and get ready for a rollercoaster. But if you don’t have the patience or time you can read the short version here. Much like any “new” adult, we were on a budget. We decided to take an overnight Greyhound bus leaving from Port Authority to Gare d’autocars de Montreal, cashing in at roughly $115. We expected to arrive in Montreal at 5:45 AM, but our hostel’s (Le Gîte du Plateau Mont Royal) front desk wouldn’t be open until 8:00 AM. Expecting this, we had planned to climb up Mont Royal for the 6:30 sunrise then get breakfast at a 24-hour diner we’d researched earlier. Until our bus driver announced the bus would run express due to the snow storm. We would be arriving two hours early. With a sliver of doubt, I told Jess we would probably arrive on time due to bus routes and traffic. But as we pulled into the rest stop in Albany and looked at the time, it dawned on us: we were actually going to arrive two hours early. We briefly contemplated staying at a 24-hour diner for four hours but came to terms with reality: we needed to book a room ASAP. I scanned Hotel Tonight (bless this site) and found five relatively cheap hotels. After four calls of Jess speaking in French, we were starting to panic. Finally, on the fifth hotel, we were able to get a room for $77 USD at Parc Suites Hotel. We walked to the hotel and found, to our surprise, it was actually really nice and true to the reviews on Tripadvisor. We were given a suite with a king bed, kitchenette, private bathroom, and – of course – WiFi. After dropping off our stuff and stretching our feet, we asked the front desk if he could map out the walking trail up to the lookout point on Mont Royal. Turns out it would be a 40 minute hike in 32 degree weather. After taking in our expressions, the concierge confessed he was an Uber driver and offered to drive us up there because he had never seen the sunrise either. His name was Jiha and he had just moved to Montreal the day before from Toronto, but was originally from Turkey. We took him up on his offer and agreed to meet at 6:15 out front. As Jiha followed Google Maps, we were met with the complication of only being able to reach the first quarter of the mountain by car. Jess and I had to hike up in the snow, following footprints through the woods, up SEVERAL flights of manmade stairs to the observation point. This had been something I’d always wanted to do while in MTL but was never able to get done. Seeing the sight up top released a humbling feeling of relief and gratitude. From there on, I knew this trip was going to be a good one. On the way back down, we found the real manmade trail, which we discovered by the end started at the next right from where Jiha had left us. Sick. The city started to wake up slowly as we walked through McGill’s campus back to our suite. We stopped at Tim Horton’s, which ruined Dunkin Donuts (now known as Domestic Disappointment to us) and any other breakfast sandwich served in NYC. Once we got back to our hotel, a well-deserved two hour nap took place before we checked out and walked to our actual hostel. After leaving our bags there, we hopped on the metro with our 24-hour unlimited passes to the Montreal Biodome. In the Biodome, there are distinct ecosystems visitors can experience and learn about firsthand. This includes a rainforest, arctic, Canadian forest, and oceanic ecosphere. It’s a great place for a half-day trip with kids or a super cute first date. MTLDuo rating: 8/10 $15 entry with student discount. Following that, we took the metro to a market the front desk at our Hostel recommended, Market Atwater. The market was lined with booths that sold smoked meats, various cheeses, fresh fruits and vegetables, artisanal snacks, and pastries. Although it wasn’t the most bustling market, it was great to see locally-sourced products and for Jess to try new flavors of popcorn. MTLDuo rating: 6.5/10 It’s not a must-see but it was a pleasant stop! We had the intentions of grabbing lunch in the Underground City while passing by the Palais des Congrès, but we ended up eating at Olive & Gourmando after failing to find the city entrance. The atmosphere was local yet hip — definitely a place to catch up with a friend or have a brunch date. The sandwiches were hot and tasty but, later in the day, did not hold up well when reheated. MTLDuo rating: 8/10 A little pricey for a sandwich but worth it in the moment. Behind Marché Bonsecours, La Grande Roue de Montréal — a ferris wheel — stands proudly at the end of a pier. Behind it lies a seasonal ice rink that was dotted with skaters. The ferris wheel takes you around a total of four times. It was a great time for pictures along the water and a rest for our feet. MTLDuo rating: 6/10. Definitely better in the summer, student discount at $21.25. On our way back to the hostel, we tried to enter the Notre-Dame Basilica, but found that after 6 PM, it was only open to its light show tours that cost $25 a person. No student discount. No thank you. We continued onward after promising to come back at some point in the weekend before 6 PM. When returning home, we both showered and took the time to become acquainted with our hostel. Soon later, we got ready to head out on the town, grabbing a drink at Bifteck Bar, dancing at Don B Comber, and ending the night with poutine at Frites Alors. In the morning, we made our way down to the free breakfast that came with our stay at the hostel. Tiny, perfectly-sized pancakes were up for grabs in addition to an assortment of breads and spreads. We decided to make our way to some thrift shops in Mile End, a neighborhood northwest of Mont Royal. The neighborhood was residential yet up-and-coming, definitely the Brooklyn or, more specifically, Park Slope of Montreal. The first shop we stopped at was Empire Exchange(MTLDuo Rating: 8/10,) where clothes were well-priced and the store itself was kept up well. A short distance away was Annex Vintage (MTLDuo Rating: 5/10,) which was very specific, overly priced vibe. Now the real action starts: we found St. Viateur Bagels, Montreal’s oldest operating bagelry and the rival of Fairmount Bagels, which was a short walk away. This rivalry has been covered by so many publications, so how could we not conduct a bagel-off? We ordered an everything bagel from both shops — Jess used butter while I used cream cheese as our spread choices. Our consensus? Fairmount wins for both types of spreads. Their addition of extra seasoning (fennel?) made the overall experience more enjoyable and tasty. St. Viateur was tasty but had less consistency, ultimately making it chewier. Nonetheless, we can’t go back to New York for bagels. MTLDuo rating: Fairmount 10/10, St. Viateur 9/10 Definitely worth testing out both shops when their bagels are less than $1.50 CAD! Hopping onto the metro, we arrived at the Montreal Museum of Contemporary Art, where a Leonard Cohen exhibition was being held. It was a beautiful exhibition, especially the sections paying homage to “I’m Your Man” and “Hallelujah.” Both had audio and visual pieces made by independent artists; specifically, the “Hallelujah” piece combined technological data, sensory, and audio components. Participants were invited to hum the iconic song’s tune into microphones and would feel the vibration of their hums within the enclosed structures. The ceiling of the structure displayed a consistently changing number of the amount of people playing the song around the world. Due to copyright purposes, we were not able to photograph or videotape anything. MTLDuo rating: 7/10 Tickets for students are $12! To our luck, the 2018 Nuit Blanche was taking place that weekend and Montreal en Lumière was being held right outside of the museum. All puns intended, but festival was LIT. The festival being held from 2/22 to 3/4 . It was incredibly engaging and had fun activities for families to take part in, such as ice sledding, zip lining, and live DJ performances. Booths were set up for brand interaction, food and beverages, and tickets for the attractions. We were able to meet Canadian winter Olympic medalists who had just returned from South Korea and roast a sausage over an open fire. The event has drawn more attention with every year it takes place, bringing people from all over the world together. MTLDuo rating: 10/10 Free entry, reasonably-ish priced beer if you convert it back to USD, and a ton of fun. On the way back to our hostel, we came across a building that had looked like it was graffiti-ed over, but I stopped when I caught a peek through its open door. Inside was a giant artisan market named Eva B. It was completely unconventional but incredibly interesting and fun! They had a bar that served $1 vegan tapas or 12 tapas for $10! On the first floor, artists had makeshift booths set up to sell their work, varying from painting to clothing designs to skateboards to jewelry. The second and third floors were the building’s thrift and costume sections. You could find Versace jeans for $9 or a costume dress for as low as $20. It’s definitely worth stopping by if you’re into thrifting or enjoy really good tapas! MTLDuo rating: 10/10. Free entry and amazingly delicious vegan tapas! We revisited the Light Festival to see the festivities at night, which were even more fantastic. The crowd had grown immensely, but the festivities somehow came even more to life. From there, we had taken the metro to a street known as St. Denis, which is lined with various bars and restaurants. To our surprise, a good portion of the street was closed for Festival Montréal Joue, a part of Nuit Blanche. Visitors were encouraged to play video games that were set up in the street. There were screens set up for PC gamers and TVs set up for those who opted to play Just Dance via XBOX Kinect. The city had done a great job with bringing communities and travelers together for a night of fun. Eventually we did find a restaurant to eat at after opposing five different all-you-can-eat sushi spots. La Demande Generale is a safe date spot with low lighting, food that is good but overly-rpice, and a casual yet sort of fancy-ish vibe. Definitely a spot to take your parents to while they visit or to bring your date if you want to stay in your nicer long t-shirt and jeans but still impress them. MTLDuo rating: 6.5/10 For two “new” adults, we were not blown away but also not disappointed. Our night out consisted of three bars/clubs and a reunion. The day before, I had learned that one of my roommates from Italy, Katie, would be coming into Montreal that day with friends as part of their winter break. WE agreed to meet up for a night out and a long overdue hug. Jess and I grabbed a drink at TRH-Bar (MTLDuo rating: 7/10), where there’s a skate bowl in the middle of the bar for skaters to take a dive in. Next stop was Cafe Campus (MTLDuo rating: 8/10) on Rue Prince Arthur. Yes, if you visit, there will probably be mostly freshmen or students from the States visiting their one friend studying in Montreal, but overall, it’s a great time with solid music and a dance floor. Our last stop was Suwu (MTLDuo rating: 7/10). Now this one surprised me. The last four times I’ve been in Montreal, I have always believed this to be strictly a restaurant. When Katie mentioned their waiter there had invited them to be on a guest list that night, she extended the invite to Jess and me. Even with their odd entry password, the place was p a c k e d. It’s a small bistro with house plants hanging from the ceiling. Music was okay, but it was definitely hard to dance due to space. Jess and I decided to leave around 3 AM to get poutine and head back to our hostel. Our last day in Montreal. We wanted to grab brunch before we made our way to the Notre-Dame Basilica. At the front desk of our hostel, Andre had recommended, Universel, where there wouldn’t be too long of a wait and the food is always good. I had been to one of the three locations my first in Montreal. The one closest to our hotel happened to be the one I hadn’t visited yet, so I searched for it in Google Maps and we were off. As we approached our location, I noticed the restaurant couldn’t be found. In confusion, I checked the map again, only to burst out laughing and be met with an unamused expression courtesy of Jess. I had accidentally chosen the University of Montreal when the drop-down menu appeared. After a scolding from Jess, we decided to check the menu of the restaurant we noticed for having a perfect Instagram aesthetic when rounding the corner, Ginkgo. We expected it to be overly priced, but to our surprise, it was reasonably affordable. Aesthetic? Check. Price point? Check. Now the food needed to live up to our expectations. Boy, oh boy, did it. Our food was great, the menu had a great variety, and the bill came out to roughly $20 CAD each. All in all? Please go. You won’t regret it. MTLDuo rating: 20/10. Fantastic food, amazing atmosphere, and great playlist. 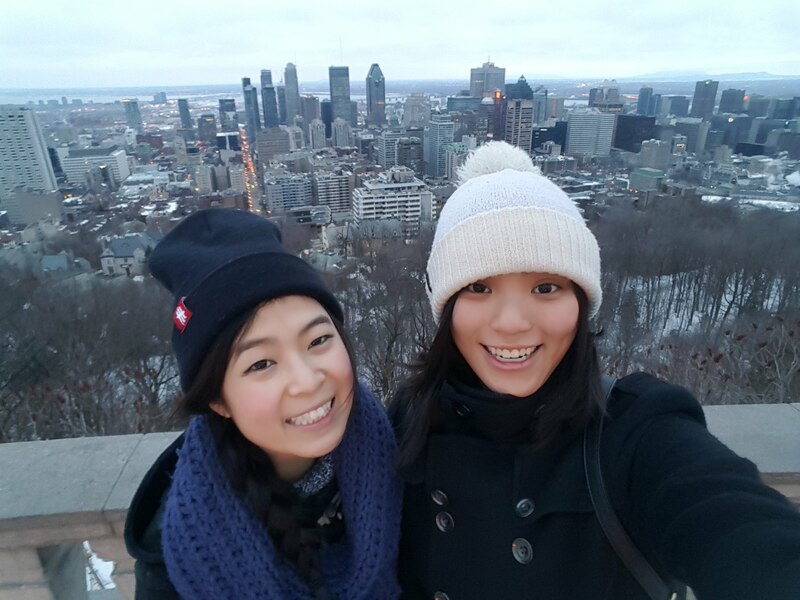 What better way to end the trip than seeing the MUST-SEE thing in Montreal? The Notre Dame Basilica stands proudly at the top of the hill protected by Paul de Chomedey, sieur de Maisonneuve. Entry was $6 a person without a guide, which we were grateful for. Per usual, the altar took my breath away with its deep hues of blue lights and powerful wood work. After a walk around, we headed out to buy last-minute souvenirs. As it turns out, we had worked out our budget so well, we still had extra to spend some on maple creme cookies, coffee at Nocturnal Cafe, and a taxi from our hostel to the bus station. If you’ve made it this far into the post, congratulations, you know the surface of what happened this past weekend. This experience was incredibly fun and unforgettable. Not only do I see Montreal in a new light, but I’ve, in a way, come to peace with it. My fifth time visiting probably won’t be for a long while. It’s always a pleasure to be with you, Montreal. Don’t ever change. Even if you do, I guess you can still say all is swell.